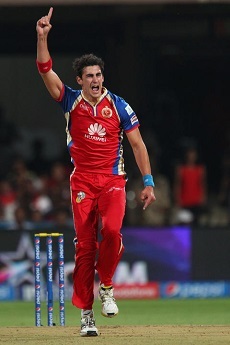 Mitchell Starc has completed his first season of the Indian Premier League with the Royal Challengers Bangalore. RCB had a tough tournament and struggled to find momentum for prolonged periods, with the Vijay Mallya owned franchise ending up finishing a disappointing 7th despite a star-studded lineup which included the likes of Virat Kohli, Yuvraj Singh, AB de Villiers and Chris Gayle. The squad showed glimpses of their brilliance but were unfortunately unable to a win a few tight games – which proved to be a fatal blow to their play-off aspirations. Mitchell had a solid debut season claiming 14 wickets and 9 catches. He ended up finishing as the 5th most valuable player in the competition after the completition of the round games which is a great achievement for his first stint in the IPL. He was a fan favourite and is set to come back bigger and better with RCB in 2015. “It was a fun experience playing in front of the packed crowds and a few guys that I have not had the chance to play with before. Unfortunately as a unit we didn’t perform to our potential but there are a lot of positives we can build on as a team for next season.” Mitchell said. He has now returned to training with the Australian set-up in the Centre of Excellence in Brisbane and will take part in the upcoming ODI series against South Africa and Zimbabwe in Harare in August followed by the Test, ODI and T20I series against Pakistan in the UAE in October.